Well , i have to say ferryman pointing is not true. That hero is my first purchase from arena shop.Even I get old curse after him. For me 85-60-60 and 90-95 for +80 should be pointing. I did 92k dmg with him against same level high power team. Most of teams i beat in arena including vengeance spirit/panda/rifleman. Biggest mistake in +80 is making team with power on paper... i win 38.8k team with my 36.4k team today. Also machinist +80 95 points is overrated. In terms of ferryman, no one has really vouched for him ever except 1 or 2, but I wil trust you and maybe bump a few points. For machinist, do you have evidence for claim? And would U change any of these? Any other info regarding Deathgore? Seems like a decent tank. Thoughts anyone? Usage perhaps? I have a question. For VG it only happens if the tank is ahead of him in the placement, it doesnt mean all tanks right? I was thinking of a team with him. Iэму got a doubt about who to use in my arena team. I'm thinking if it would be better to replace someone from my main with VS or AS or Mystic? I would suggest: Iron hoof, wc, oc, mystic, AS/leaf/com. *Photos below are from website. Not my team. 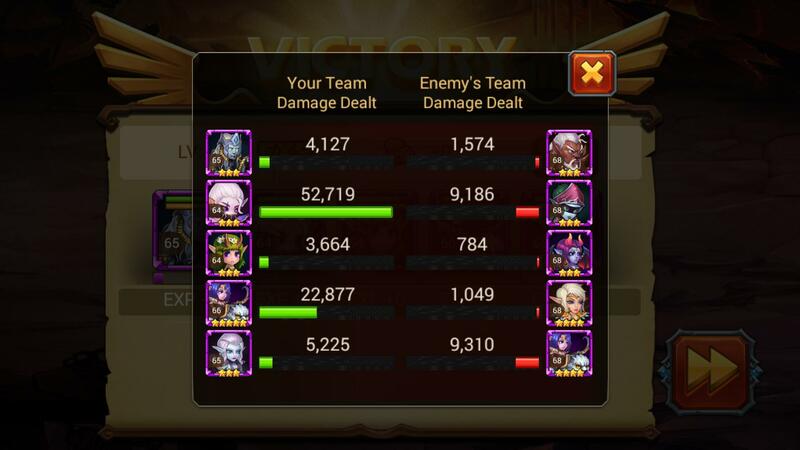 Don't replace anyone for now, VS and AS needs level 70+ to be good, Mystic doesn't work very well for your speedy cookie cutter attack team for now. Those are teams for 80+, not really suitable for low levels. Should i change any hero? These are below 73 except Succub. But none of their skills are at their lvl should i chase money and max them out? Hidden Needle has been doing really awesome for me. She has a nice lockdown like Old Curse (web attack) that maybe lasts less time but does not give other team energy. She also has a sapper like ability when she pops in and pops out. She has been doing MASSIVE damage for me in crusades so I will get some arena data today. Once her energy is full, she can almost spam her ultimate. Not uncommon to see her do 2+ ultimate in same round, much like frost mage. She may be squishy, I will find out.